Over the last decades, many areas of research have been significantly changed by two different kinds of light sources: advancements in optical lasers have propelled studies into ultrafast processes, new materials, and many other fields, while intense X-rays produced at synchrotrons have helped image tiny structures and otherwise invisible parts of matter. Recently, these two research pursuits are seeing increased interactions and fruitful collaborations. As one example, table-top sources of coherent soft x-ray radiation have been the aim of research for the last couple of years. Arguably the most prominent representative of these sources, lasers based on high-order harmonic generation (HHG) have become established tools in attosecond science to probe electronic transitions at unprecedented temporal resolution. However, other applications are emerging that demand for more intense and/or tunable radiation. 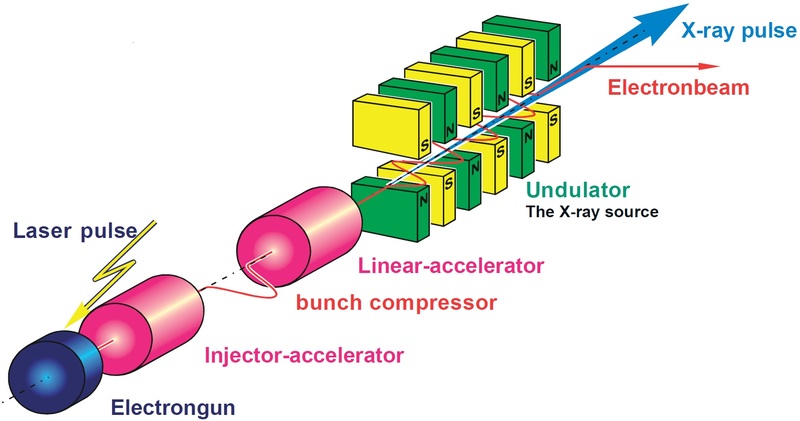 Free electron lasers (FEL) are able to deliver pulses as short as a few femtoseconds at wavelengths down to 0.1 nm with a brightness surpassing synchrotron light sources by many orders of magnitude. This significant increase in brightness will e. g. allow for improved imaging in the field of biology: the structure of proteins forming the membrane of cells can only be resolved with coherent radiation of such brilliance. To create an FEL, a beam of electrons is accelerated to almost the speed of light. The high-energy electron beam then passes through an undulator, a magnetic field produced by a periodic arrangement of magnets with alternating poles across the beam path. The transverse acceleration (‘wiggling’) of the electrons across this path results in the release of photons. Interaction between the emitted photons and the transverse electron current (by means of the ponderomotive force) causes bunching of the electrons and coherent addition of the photons, and consequently a coherent laser-like emission of light. Emission wavelengths can reach from the terahertz region via the infrared, visible, and ultraviolet range down to the X-ray region, depending on the design of the FEL. One problem associated with FELs is the lack of temporal coherence due to a noisy startup process. To avoid this, an FEL can be seeded with a laser tuned to the resonance of the FEL. Such a temporally coherent seed can be produced by high-harmonic generation using an optical laser pulse. This results in coherent amplification of the input signal; in effect, the output laser quality of the FEL is characterized by the seed. Thus, the advent of large scale FELs in several places around the world has also intensified research into intense coherent femtosecond sources in the extreme UV/soft x-ray range based on HHG. Being one of these FEL endeavors, an X-ray FEL (SwissFEL)  is presently being built at the Paul Scherrer Institute in Villigen, Switzerland, and seeded operation is a considered option for the soft X-ray branch (ATHOS). The group of Prof. Christoph Hauri  is working on the development of a spectrally dense HHG source (120-5 nm wavelength) delivering laser pulses strong enough to overcome the noise issues in FELs. 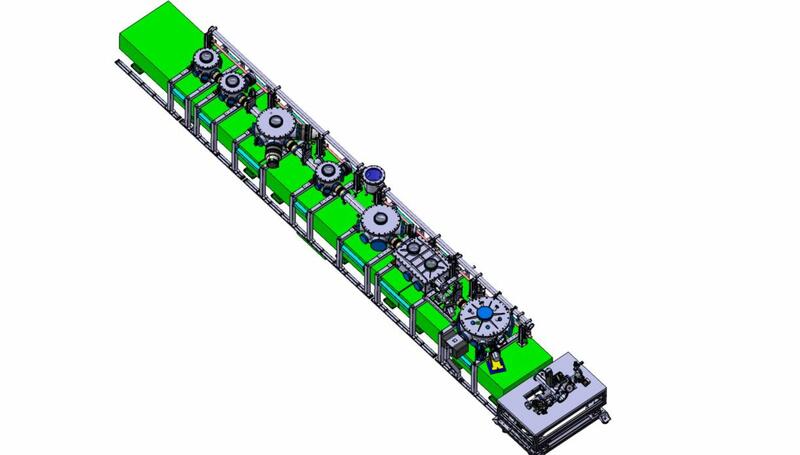 For exploring the full potential of a HHG-based seed source, a HHG beamline has been built in the SwissFEL laser laboratory. For characterizing the HHG radiation, the beamline relies on state of the art equipment. A calibrated photodiode is used for absolute photon flux measurements and a spectrometer provided by H+P SPECTROSCOPY  along with an Andor Newton DO940P-BN camera is employed to quantify the spectral density of individual harmonics at high resolution. The grazing-incidence spectrometer uses an aberration-corrected grating for flat-field imaging of the 1-80 nm spectral range. The spectral range 5-80 nm is covered with a single grating and in this range the spectrometer can be used without entrance slit to maximize light collection, meaning that 80% or more of the incoming beam can be used for measurement. This configuration directly images the harmonic source onto the detector and consequently yields an improvement in collection efficiency and signal-to-noise ratio up to 25 times compared to traditional XUV spectrometers (see e.g. [4-6]). While a mechanical filter suppresses the fundamental IR laser light, a filter unit in the device allows for inserting thin metal filters into the beam path for selecting a specific wavelength region for closer observation. Generally, the modular design of the instrument allows for adaptation to different experimental situations, a feature highly appreciated in large-scale research facilities such as the PSI. First measurements with the H+P spectrometer demonstrate the improvements of the instrument compared to existing spectroscopic tools. With the same signal strength, the resolution of the H+P instrument is significantly higher (<0.02nm detector-limited resolution) compared with a standard spectrometer already installed on the HHG line (see figure 4) . An equivalent resolution with the standard approach would require a narrow slit setting and thus a significant degradation in signal strength. The proprietary H+P approach without an entrance slit delivers high resolution and signal strength at the same time. The full spectral characterization of the HHG seed by the H+P spectrometer in combination with the Andor X-ray camera will be a crucial component for reaching the ambitious goals of the SwissFEL in the upcoming years. Fig. 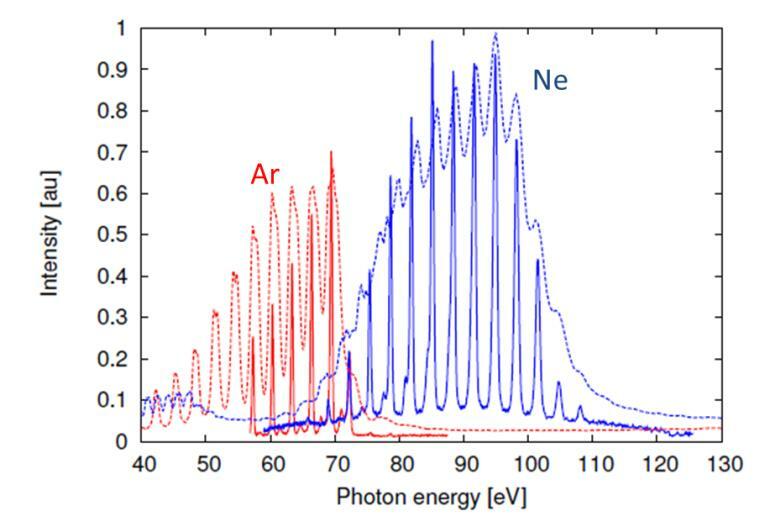 4 - HHG spectra from Neon and Argon gas, recorded with a standard spectrometer (dashed line) and an H+P XUV spectrometer (solid lines). Thin metal foils were used for spectral filtering (200nm aluminium foil for the Argon measurement, 200nm zirconium foil for the Neon measurement).